The "Holy Family" window at Nativity Catholic Church in Torrance was vandalized in November, 2011. The "Holy Family" window at Nativity Catholic Church in Torrance was restored by Ancient Arts and reinstalled in January, 2012. Nativity Catholic Church in Torrance, California (http://www.nativitycc.org) has an outstanding collection of mid 20th century stained glass windows. Ancient Arts Stained Glass Studio (http://www.ancientartsstainedglass.com) in San Pedro, has had the privilege of working with these outstanding works of art for almost 20 years. In every previous case, the restoration work was necessitated by the normal aging patterns of stained glass: usually bulging or bowing caused by decades of exposure to wind pressure and the effects of gravity. Unfortunately, the damage to the "Holy Family" window, was caused by an unknown person who threw a heavy object at the window from the church parking lot in the middle of the night in early November of 2011. In the photograph of the damaged window, at least six broken pieces are clearly visible. Several other pieces sustained cracks that are not visible in the photograph. 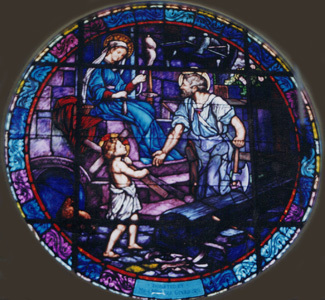 This window at Holy Family Church in Wilmington, restored by Ancient Arts in 1999 has a nearly identical design to the "Holy Family" window at Nativity Church in Torrance. The stained glass window was removed by the church plant manager, Rob Hardin, and delivered to Ancient Arts Stained Glass Studio in San Pedro. While browsing through the Ancient Arts portfolio of church projects, Rob discovered a photograph of a stained glass restoration performed for Holy Family Church in Wilmington in 1999. The main subject matter and its depiction was nearly identical and clearly the work of the same studio. By making a visit to the choir loft at Holy Family we were able to confirm all of the needed details for our restoration work on the "Holy Family" window at Nativity Church. The window was reinstalled at the end of January and everyone was pleased with the results. Thank you to the Reverend Alfred J. Hernandez at Nativity for your continued confidence in us since 1999 with 12 restoration projects completed. And thank you to your predecessor, the beloved Reverend Patrick McHugh, who started us off on our relationship with Nativity in 1993. Father McHugh passed away in the summer of 2011 at the age of 89.